This is probably more than you ever wanted to know about pew cushions, but when you are buying a cushion to last decades it pays to be informed! All Waggoners pew cushions are made to the full length of the pew, with a standard 2 inches of foam to provide years of comfortable seating. Foam thickness is based on your special needs; Waggoners can make cushions from 1″ to 5″ thick, as required by your situation. Pew cushions must match the shape of the pew bench. A proper fit to the bench is essential. As shown here, there are three basic cushion shapes. Numerous cushion styles are available to allow you the maximum choice for your seating needs. The self-welt or box style is the classic look and is reversible. The contour style cushion offers a pleasant rounded edge for extra comfort and a pleasing contemporary look. 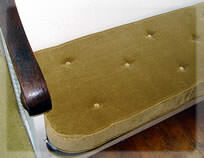 In addition, Waggoners offer Wedge Shape Cushions (thicker at the rear, thinner at the front) and a rounded nose cushion with a welt less front. Non-reversible modular or board-based cushions are also available from Waggoners, and are well suited for some contemporary pews. All styles can come with a non-skid strip. 3/8 inch plywood base, 2 inches of foam, with a welted fabric case, pressure-stapled at our plant. No buttons needed for this non-reversible style pad. A popular option with a custom rounded foam edge on opposite corners of the cushion. The cushion retains its reversibility yet presents a very contemporary look. Our popular reversible pew cushions give you two sides of fabric for long-lasting wear and come with an optional non-skid pad that lays underneath and inhibits cushion movement. Reversible pew cushions are available in the traditional self-welt box shape style, or our popular contour style cushion with two rounded edges on the opposite corners. We also offer non-skid strips (the blue pad under the cushion in the picture to the right) with all our reversible cushions. 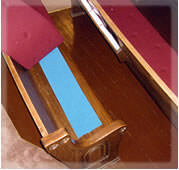 When the cushion is sat upon, the non-skid pad securely grips the pew cushion to the pew, allowing you to reverse and move the cushions to pews of the same size. Everyone asks “Do the cushions slip? Do the non-skid strips work?” Thousands of churches nationwide have discovered that the non-skid strips really do prevent the cushions from moving, which is a great feature of our reversible cushions. We use a 90# kneeling foam and a slightly different tufting pattern for these cushions. 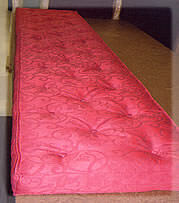 Velvet is the most popular fabric choice, and a 2-1/2 or 3-inch foam interior is the most common thickness. 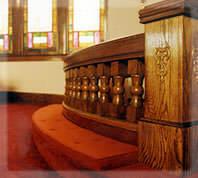 Many older churches have pews with a rounded entry corner. This corner is generally best to follow when making cushions for such pews. Waggoners can take a pattern so your cushions look truly custom made! If your old cushions have the “feel” and weight you like the best, it is possible to re-use them inside your new cushions. We can do one cushion as a sample so that you can evaluate this option for your church. Extra attention and accurate measurements are a must for any special fitting cushions. We have honored requests to duplicate a particular look or thickness for various projects. The type and weight of foam, the thickness of the pad (from 1 to 5-inches), the “puffiness”, and the number and spacing of buttons can all be varied to create the look and feel you want. After all, pew cushions truly are “our specialty”! Working in consultation with church designers and acoustical experts, Waggoners has pioneered the development of acoustically friendly pew cushions through using special fabrics and special foams. We are happy to provide information and specifications to all interested parties. Each year more and more congregations nationwide add cushions to their existing pews. Our 45 years of focusing exclusively on the manufacture of pew cushions gives us the experience to meet your individual needs. Here we explain the reasons most churches prefer Waggoners. We are a company that exclusively manufactures cushions for churches and chapels. With 45 years of experience in the church cushion field, Waggoners has the experience and commitment needed to produce quality pew cushions that last. Waggoners use only the best fabrics available. Our fabrics are treated with stain resistance protectors, and our cushions are finished with matching fabric-covered buttons tufted by hand. Cushion purchases are typically a group decision and represent a major decision for any size congregation. Waggoner’s understands this and gladly gives you all the time, materials, and information you need to make a good selection. Because you need the versatility that a reversible cushion provides. Waggoners recommends the use of reversible styles of pew cushions because only reversible cushions can be flipped over and rotated to double fabric usage and to keep that “like new” appearance. Reversibility ensures that if an accident or vandalism should occur, affected cushions could be easily repaired or replaced by our factory. Custom-made reversible pew cushions fit great, stay in place, and have been used successfully by American churches for over 155 years. Our prices are competitive. Our quoted price is straight from the factory to you (including free delivery), so you always know the full cost in advance. 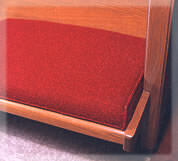 Waggoner's Inc. has specialized in quality custom-made church cushions for over 45 years. Fine workmanship, quality materials, and friendly customer service are the essence of the Waggoner's experience. Request a free and custom quote for your church pew project.